Born 28 years ago of Dutch-German descent, Loyd is of fair complexion, has blond hair, grey eyes, is 6' 2" and weighs 195. He attended Richmond schools where he starred in baseball, winning the outstanding player award. 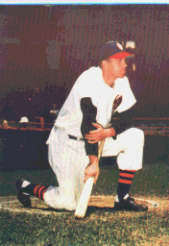 Loyd started professional ball in 1938 and came to the Oaks for the first time in 1940. He returned on January 21 of this year. Hunting and fishing are his hobbies but to him there is no greater baseball thrill than batting a homerun with bases loaded.